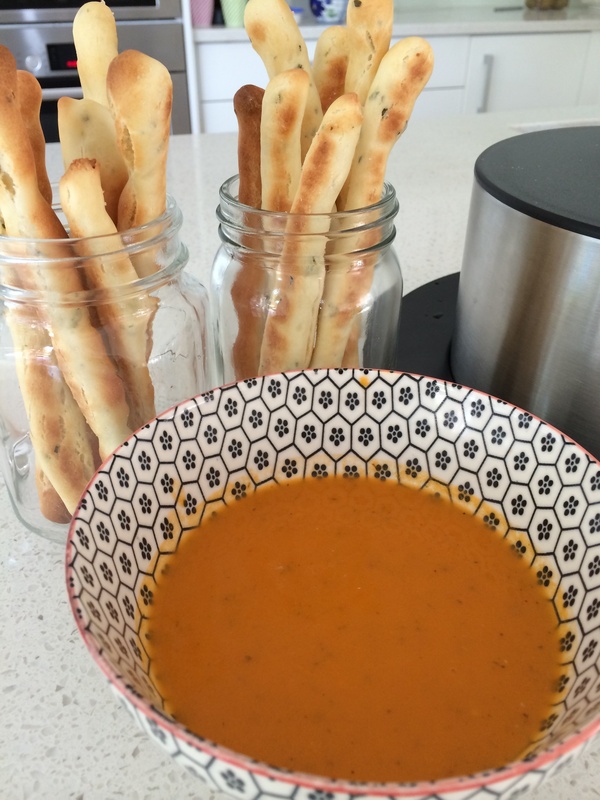 Thermomix guided creamy tomato soup is perfect for kids afternoon tea. Requires 700g of fresh tomatoes, garlic, onion, tomato paste, vegetable stock and fresh herbs. Used milk instead of cream and sweetened a little more at the end because the tomatoes weren’t very ripe. Cooked in 12 minutes. Served with grissini dipping sticks. The kids love these sticks ! Made grissini from the pizza dough recipe flavoured with chopped garlic and rosemary, brushed with olive oil and sea salt before baking for 10 minutes at 200c. The other half of the dough was rolled less thinly and snap frozen for lunch boxes.